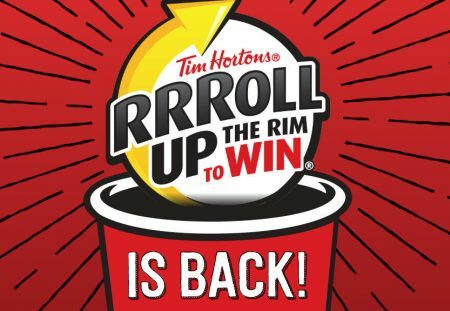 Tim Hortons‘ popular “RRRoll Up The Rim To Win” promotion is back! The contest is available now and goes until April 17, 2019 or while contest cup supplies last, whichever occurs first. All prizes must be claimed by May 3, 2019. There are millions of prizes to be won! The odds of winning a prize is 1 in 6. If you’re not familiar with Tim Hortons Roll Up the Rim to Win promotion, when you purchase a hot beverage in Canada or in the U.S., you can roll up the rim on the cup to see if you’ve won a prize. Click here to visit Tim Horton’s website for more details. Click here to find a Tim Horton’s restaurant near you.